This is a fascinating 1992 U.S. Geological Survey map or photomosaic of Enceladus, the sixth largest moon of the planet Saturn. An inset in the upper half of the map features the North Polar region of Enceladus. This map was based on the images from Voyager 1 and 2. 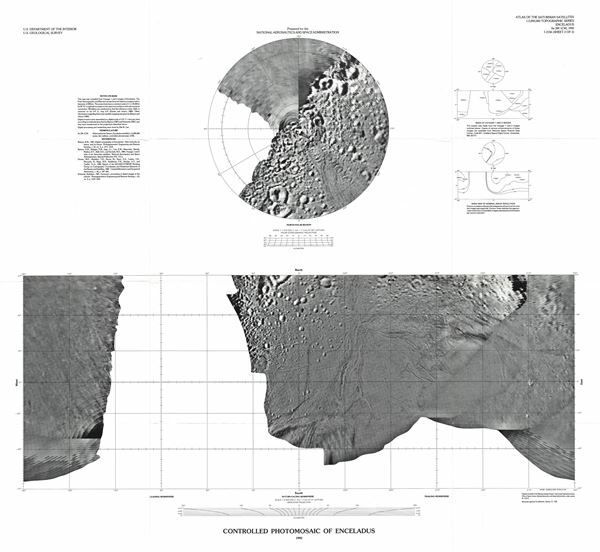 This map was prepared for the National Aeronautics and Space Administration and published by the U.S. Geological Survey as Atlas of Saturnian Satellites Topographic Series map I-2156 sheet 2.